Ambassador Ngo Quang Xuan*, former Vietnamese Ambassador to the United Nations in New York (1993-1999), tells VIR about his memories of the journey towards normalisation of relations between Vietnam and the US. My heart was beating fast throughout the whole conversation, as I was very happy. From the content of the message, as well as the way Ambassador Albright was saying it, I understood that the US side wanted me to communicate the information to Hanoi in the hope that the highest leaders of our government would also officially make the same announcement. I thanked the Ambassador and immediately carried out the historic task of reporting to the capital. Madeleine Albright was the first female US Ambassador to the United Nations from February 1993 until 1997, and was known for being very tough. I got the sense that even the Secretary-General of the United Nations at that time, Boutros B. Ghali, and many countries' ambassadors would not have crossed her. However, Ms. Albright was always extremely friendly with me, smiling when we shook hands and said hello; some friends of mine, when they saw our good working relationship, even asked me if I had a tip or secret method for them. Once, on the sidelines of a consulting meeting between the Ambassadors of the US and ASEAN countries at the US delegation's headquarters, Madeleine told me that her daughter had worked with a charity project in Vietnam, and came to really like the country and the people. Another treasured memory happened in the third week of September 1996, when I accompanied then-Deputy Prime Minister Nguyen Manh Cam to attend a traditional banquet hosted by the US Secretary of State on the occasion of the 51st session of the UN General Assembly. As I walked through the gate and shook hands with the host, I told Madeleine that I foresaw that she would become the Secretary of State. She laughed, surprising Minister Warren Christopher. He turned back and asked what I'd said. In fact, at that point there were at least three candidates for the Secretary of State position. But eventually, she was appointed by President Bill Clinton on December 5, 1996 to become the United States' first female Secretary of State. I met her afterwards, in November 2000, when she was a member of Bill Clinton's delegation officially visiting Vietnam in Ho Chi Minh City, and everybody was very pleased to hear that story. In one month, Vietnam will welcome Barack Obama, the 44th President of the United States. On hearing this news many memories resurfaced in my mind, events which include friends, colleagues, and historical figures. In September 1997 I attended a programme in New York hosted by John McAuliff, the founder of the US-Indochina Reconciliation Project (USIRP), which was founded in 1985 and later changed its name to the Fund for Reconciliation and Development. Over the course of the programme I participated in a dialogue between Vietnamese war veterans and former members of the Deer Team, a US military team under the leadership of Major Allison Thomas assigned by the Office of Strategic Services (OSS) to help President Ho Chi Minh in Vietnam in 1945. I was very moved to hear what they shared about the support and friendship between the Americans and President Ho Chi Minh. But these friendly relations were cut short after 1945, when the Deer Team was withdrawn; later, the US supported France in the war, and eventually the Geneva Accord cut Vietnam into two, leading to 30 more years of war. History is history, but history must not repeat itself; it must instead inform our next steps into the future. “Although ever mindful of the past, we are dedicated to a future of prosperity, peace, and freedom for all,” said John Kerry, a statement that rings true for both nations today. On September 20, 1977, Vietnam became the 149th official member of the United Nations when the Jimmy Carter administration did not use its veto in the UN Security Council. But it wasn't until April 1991 that a roadmap detailing the steps towards normalisation, proposed to the Vietnamese government by President George H. W. Bush, was created. The roadmap was the result of a lot of shuttle diplomacy and negotiations at the United Nations in New York, Paris, and Bangkok, and was carefully planned out by people who have now become historic names, such as Vietnamese Minister of Foreign Affairs Nguyen Co Thach, US Secretary of State James Baker, Vietnamese Deputy Minister of Foreign Affairs Phan Hien, Tran Quang Co, Assistant Secretary of State Richard H. Solomon, US Ambassador Leonard F. Woodcock, general John Vessey, and many others. In discussing the process of normalising relations between Vietnam and the US, I cannot help but mention the very important contribution of current US Secretary of State John Kerry and his friends, especially John McCain, who (like Kerry) is a Vietnam War veteran and became a US senator. Following his return from the Vietnam War in 1970, John Kerry was steadfast in his opposition of the war, and after becoming a senator in 1984 lobbied for the improvement of diplomatic relations with Vietnam. Before Bill Clinton announced the lifting of the embargo, senator McCain and then-senator Kerry went to Vietnam many times to do research and hasten efforts to find American soldiers still missing in action from the war. Even now, Vietnamese people still tell one another that these two senators are strong pillars, one from the Democratic Party, the other from the Republican Party, supporting the process towards normalisation and the development of good relations between the two countries. Their research on missing soldiers created trust between the two sides and laid the first foundations upon which normalisation was built. In the mid-90s, I had the chance to thank the senator from Massachussetts, John Kerry, for his contributions when I was the ambassador and Permanent Representative of Vietnam to the United Nations. At that point, knowing that I was about to visit his state, he wrote me a very warm letter of welcome. After Bill Clinton became president, the process of normalisation became smoother and went more rapidly. On February 3, 1993, the embargo preventing Vietnam from borrowing from the International Monetary Fund (IMF) and the World Bank (WB) was lifted. On March 3, 1994, the commercial embargo was lifted. Then in 1995, many historic milestones were achieved one after another. On January 21 the two sides officially signed agreements settling property claims and establishing liaison offices in both of their capital cities. On May 15 Vietnam gave the most comprehensive list of missing soldiers they had to the US. In June, the American Veterans’ Association announced that they supported the normalisation of diplomatic relations with Vietnam. On July 11 and 12 the Washington, DC and Hanoi announcements on normalisation were made. In those exciting years and long afterwards, I had the honour of meeting many American friends, some of whom will be mentioned in the following paragraphs. I always try to do something, no matter how small, to encourage and support them, such as a tight handshake to thank them when I have the chance, or a suggestion or advice, or if they travel to Vietnam, giving their information to Hanoi and asking the Ministry of Foreign Affairs to welcome them and support their activities during their stay. These little signs of appreciation are not only an ambassador's responsibility but also me personally showing my gratitude to my American friends who have loved and helped my homeland, each in their own way; and I understand that they sometimes meet difficulties doing so. I'd like to tell stories about some of the people I met, like the writer Lady Borton. She came to Vietnam in 1969 to research and write pieces about Vietnam, and said that “going to Vietnam is like going home”. Another friend, Doctor Judith Ladinsky, was lovingly nicknamed “Madame Vietnam”. People estimated that between 1978 and December 2004 she went to Vietnam 112 times. In the book Vietnamerica: The war comes home, Judy Ladinsky was described as one of the first people after the war who acted as a bridge between Vietnam and the US. Another bridge between our countries is the founder and president of the Indochina Arts Partnership fund, painter David Thomas. He has made 50 trips to Vietnam since 1987, to research and carry out culture and education exchange programmes between Vietnam and the US. His works on President Ho Chi Minh, General Vo Nguyen Giap, and about the country and the people of Vietnam are celebrated all over the world. 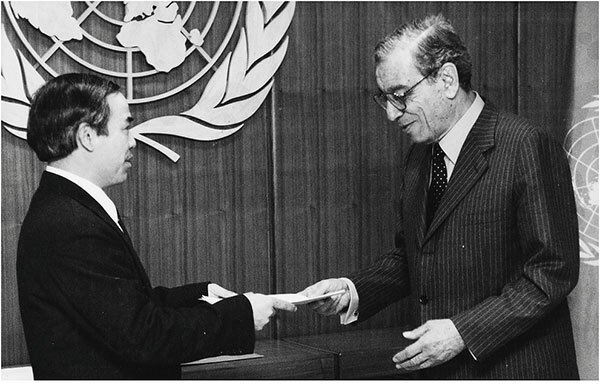 Throughout the period when I worked as Vietnamese envoy to the United Nations in New York (from June 1993 to 1999), our office continually received help and support from the family of Merle Ratner, who has supported Vietnam since 1969. And finally, Charles Baily, then-representative of the Ford Foundation, helped us build and implement the Vietnam-US Dialogue Group on Agent Orange, which I had the honour of leading on the Vietnamese side. I would need a long book to do full justice to the contributions of these people. Although I will not be able to name all of the American friends I met while working abroad, their help is not forgotten; we were supported by a large number of people who worked at many charities, non profit organisations, funds, institutes, and universities. I greatly appreciate their contributions, and I consider them as hardworking bees who gathered together in a swarm to build a solid connection for peace and prosperity between our two countries. Normalisation of relations enables both Vietnam and the US to resolve differences and open up opportunities. However, there still remain many difficulties between the two countries due to the unique characteristics of American politics. Those of us who worked on normalisation therefore required, and fortunately enjoyed the support of, friends like Virginia Foote. My colleagues lovingly called Virginia Foote “the woman at the end of the Senate lobby”. Giny accompanied us throughout the lengthy and difficult negotiations on the BTA (Bilateral Trade Agreement), the long journeys over the 10 years of negotiations for Vietnam to join the World Trade Organization (WTO), and the sleepless nights during negotiations for the Trans-Pacific Partnership (TPP). I still remember very clearly the many useful things I learned from meetings, work discussions, and various other talks with Giny. She worked with me when I was in the joint Vietnam-US advance party to prepare for and greet the delegation of then-President Clinton to Ho Chi Minh City in November 2000, and during the six years that I was an ambassador in Geneva. She was there when I participated in WTO conferences all across the world, when I went to Hanoi to attend the APEC 2006 summit with the participation of president George W. Bush, and when I was a member of a high-level delegation visiting Washington, DC. I am very happy to see that now “the woman at the end of the Senate lobby” has become the director of Amcham in Vietnam, at a time when US-Vietnam relations have reached new heights. Thanks to these tireless efforts, the many high-level visits by leaders of the two sides, the hard work by the two first ambassadors, Le Bang and Douglas Peterson, as well as that of succeeding ambassadors, and the support of many organisations, individuals, and business communities, the co-operative relationship between the US and Vietnam is still growing. In the summer of 1995, just after normalisation, insiders like us could not have imagined that one day trade between our countries would grow from $500 million to more than $35 billion, there would be almost 20,000 Vietnamese students studying in the US, co-operation between the two sides would spread to sensitive areas such as security and defence, and confidence in our mutual understanding could have eliminated differences and barriers so quickly. Relations are deepening even faster since Barack Obama became president. He has focused the attention of the US government on the Asia-Pacific region and more particularly on Southeast Asia, offering US support on the East Sea problem. The US has deployed 60 per cent of its naval forces in this region, and has pushed for ratification of the TPP, showing Vietnam's position and strength in both security and economics within Southeast Asia. July 25, 2013 became a new landmark in the history of US-Vietnam relations: in Washington, DC, US President Barack Obama and Vietnamese President Truong Tan Sang decided to establish a comprehensive partnership between the two countries in all aspects. The visit to the US of Vietnamese General Secretary Nguyen Phu Trong in July 2015 deepened this partnership. I believe that during his official visit to Vietnam in May 2016, President Barack Obama will turn a new page in the co-operative relationship between Vietnam and the US, making it more comprehensive, more strategic, and more prosperous.